File this under "Everybody looks amazing next to her" maybe, but I did go out with my sister and good friends Lisa & Sam last night and felt FAB.U.LOUS. At Darcelle's, the birthday guests have to stand up and announce to the audience name, age, and occupation; Darcelle him/herself held my hand and called me "lovely," with sincerity. I'm not saying a drag queen's proclamation means any more than what my family and friends (you kind & generous readers included) have been telling me throughout my laments this year, but who doesn't love a little extra boost from unexpected places? I think I'm gonna like this aging thing after all. What a great celebration! 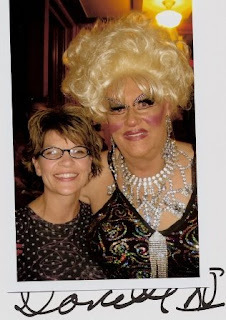 Nothing says "young at heart" like a drag show. You are the hottest 20 x 2 non-drag queen around. Amen. Welcome to 40. It's great! It sounds like you had a great time!! if this is 40 i'll take a big dose! glad you have started it off with a colossal bash! Some of the performers were SO PRETTY. It made me want to weep. Happy birthday! It was a great time. Sounds like a fantastic birthday weekend! You make 40 look appealing!! Drag or not...I'd let anyone tell me I was lovely. Yes, I'm that shallow. Darcells is unreal, isn't it! You are LOVELY! Happy Birthday, sweet lady. Glad it was a memorable one! Happy Birthday-41 is even better. You look awesome S. When you said you went out with your sister and.... I nearly choked (looking at the picture) until I read a little bit further. For one split second I was like, OH MY GOD THAT"S HER SISTER???? I was in stitches for a few minutes. Thanks for that! This is really your time of the year! Your blog absolutely GLOWS right now with wonderful photos and words and pure bliss! WOO HOO for YOO HOO and Happy Birthday TOO OOO!! !